A fresh curl and color on my locs does something magical to me. Self care is so important. I feel shiny new yet old soul. The curl pattern reminds me of a 40s hairdo. That's why I opted to wear my vintage thrift store dress. The one that was only $1.50 at the dingiest Salvation Army I had ever been in. You know how a thrift angel sings when you've found treasure? An entire choir sang to me when I laid eyes on this one! Despite being 100% poly, it's very silky and it just oozes femininity. I feel like a proper lady when I'm shoveling goat cheese in my mouth with a butter knife. Some short legged people avoid tea length dresses fearing the legs will get shorter. I am not of that school of thought. When the dress is so right, I don't let "the rules" stop me from enjoying the pretty. Since I was in a vintage state of mind, I dove in with vintage earrings, belt, and gold metallic clutch thus breaking one of my own thrift style fashion rules. Though shalt not look like you're wearing a costume. I'm wearing pieces from different decades so I feel like I've broken up the vintage a bit. Wearing current style pumps helps me out too. 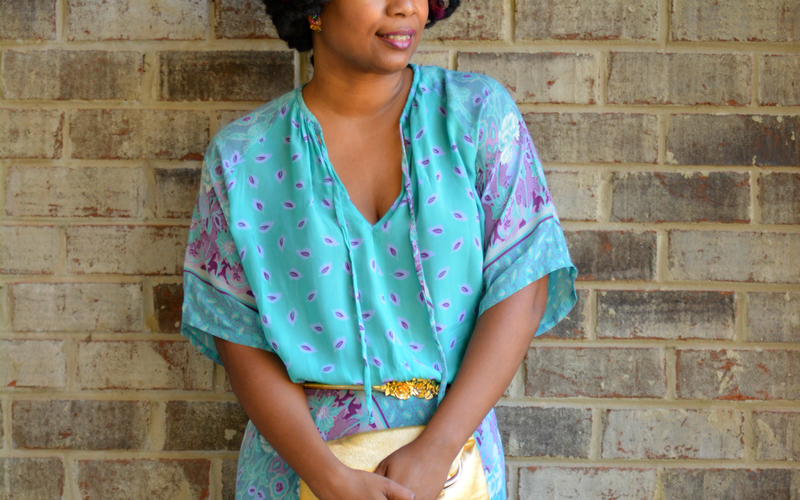 Do you wear vintage dresses? I really love my new Trieste Red highlights. I'm thinking about doing my entire head. If you'd like to give Madison Reed hair color a try? Use code "MRPAMPER" for 50% off. Have you entered to win the Henri Bendel baubles, yet? Only 2 days left! When I go all old soul, this is what my instagram bathroom selfie looks like. 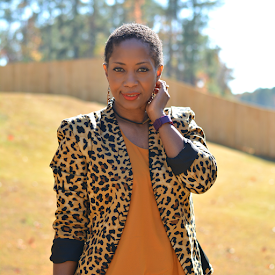 Linking up with the lovely ladies of Thrifters Anonymous and What I Wore Wednesday. The baby blue color is so gorgeous on you. 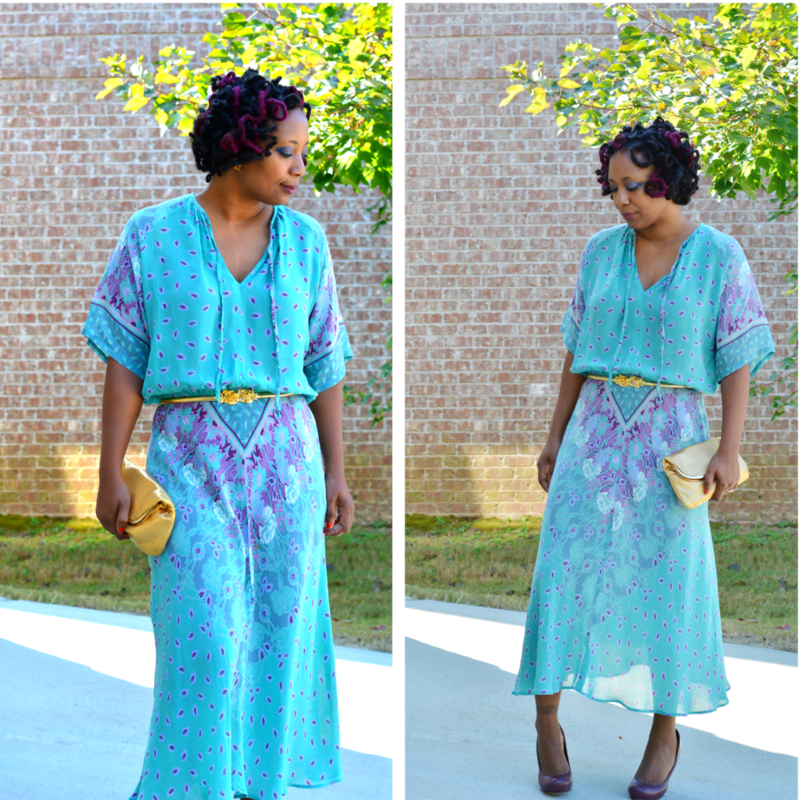 Gorgeous dress...and yes, I wear vintage, everything in my closet is vintage or almost! This is a gorgeous dress girl!!!! And, that belt. LOVE! what a gorgeous dress. you look stunning in it! Love the dress! I think that we all have to kind through fashion rules out the window and just shop what appeals to us and what looks good on our bodies. And that varies from person to person. These colours look beautiful on you!